This is my product review of Keywords English. Below you will find a review of the freeware version available today 28.9.12 on the iPad. 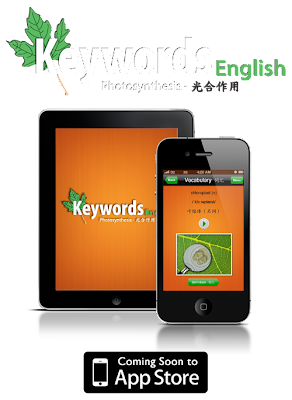 Keywords English is an app for iDevices aimed at the Chinese-speaking learners of English and science. Keywords English shows how a vocabulary pre-teaching stage of an English language lesson can be turned into an app. This particular lesson is on describing photosynthesis. Using this for the first time this morning felt very much like observing a trainee teacher on the CELT course here in Dublin: there is much admirable care taken but you want them to allow the learner to lead a bit more. The Introduction has two pages. One is a simple welcome and statement of the apps objectives for the learner. The second page presents a dense text explaining the process of photosynthesis. The grammar in the text is easily understandable by typical intermediates in Dublin or- according to this according to CEFR descriptors here- possibly A2+. The problem is not the grammar, but the vocabulary. This text is for school students or people in the initial stages of transferring their professional expertise to English to open themselves to worldwide opportunity. Much science is now taught through English internationally. This makes sense because any career in science involves collaboration internationally. So there is surely a place for this sort of application. Is this the best way to approach it for your students? Let's look. There are 24 pages. This is the heart of the app. 12 words are examined in the general context of describing photosynthesis. The words all feature in the introduction text. Like the initial stage of a traditional PPP "Present, Practice, Produce" English Language Teaching lesson, each word is presented for that particular context. Each word is a piece of data about the about the topic or context, each word also carries a lot of metadata. Learners need that metadata to use the new words or phrases productively or receptively. But every word and fact we know is stored away with lots of metadata, the knowledge about the information. Automatic Mandarin recording of the word read aloud in citation form (audio) - Not using a text-to-speech application is a good choice. Growing this app to cover a course will mean this gets sacrificed but this is a choice for quality. A graphic- These are notoriously difficult to get right- i.e. Can one picture suit the context for every user? These are ok but not terribly attractive. Some are stock photos and some seem to be original drawings so the theme is 'eclectic' at best when visualization is the arguably strongest asset of the iDevice range for the language learner. A dictionary-like definition phrase (text)- Again, really hard to get right for everyone. This is why concept checking questions, intelligent learner-focussed teachers will always be needed in schools and training will always need to be teamed up with experience to activate knowledge. An example sentence containing the word in use- The examples keep the word in the same context, but provide a different example sentence. This is often how teachers get learners to triangulate a meaning. At least they get them to the point where the learner believes they've learned the concept. The teacher provides many examples and definitions and in some cases translations to help learners construct their own concept of what the word-item represents. Sometimes they help them choose a specific and direct translation. But will it attract money to the maker? Will it be a template for a big (evil) publisher? Is there an original piece of technology or a new approach here? Well maybe in the third section. This section has two elements: 1) feature drawing attention to the learner's own assessment of where the syllable stress lies in the 12 words and 2) a simple voice recorder and playback application. A Voice Mirror, if you like my term. This is a simple step forward. Some English Language Teachers choose to focus on the sounds as previously detailed in this blog. This is a mistake. But it feels right because sounds stick out as obviously different- but only because we can show that difference in writing. Consider this: you are in Chinese takeaway and the girl at the counter is being discussed by two trainee English language teachers just outside the door. You overhear two comments they make. You might hear any half-drunken spring roll eater identifying this as pronunciation problem. But who provides the solution? It would take a knowledgeable English teacher, speech therapist or a phonologist to note the underlying tongue placement problem and work on perception and awareness. Tough work. "She was like spring roll- as opposed to what? like- spring rock?" Usually the anyone would identify this as something odd, but nobody is going to say "Her syllable stress is off." It would take some insight or training to say "She doesn't know that we stress the first word in compound nouns like traffic light, dinner jacket and spring roll" A teacher would need to read a couple well-selected book pages or participate in workshop to prioritise syllable stress over sound differences because we as native speakers just don't have the vocabulary or the cognitive tools to talk about it. Once we get there as teachers it takes relatively little work to identify syllable stress as a learning issue (and memory aid because we recognise words in speech primarily through syllable stress!). We can help our learners tremendously by steadily raising awareness of syllable stress. Little more than asking where the stress is does the trick. It actually is the right question. Our job as teachers is to raise awareness of these issues in lessons so that they are more capable of observing them outside of lesson hours. Keywords English finds a way to present the learner with the question thereby raising awareness. Each word's pronunciation page quizzes you about which syllable is stressed and shows you where the breaks in the word should be if words were helpfully divided by syllables. There's the button which allows you to listen as many times as you want. But it also encourages you to try it yourself and self-assess. It does this by providing a very quick and clean record-and-play feature: a "voice mirror" as I like to call it. I think all classrooms, English learning apps and teachers and learners should have one. It should be loud though. The iPad is ideal for this I found this morning. This is a basic and it maintains what I think is a new standard feature for interactive language learning applications on and from the web. Voice Mirrors need not process your speech. They just record it and play it back: the faster and easier, the better. This one does it fine and fast on the iPad. Keywords English is a nice addition to your school's app collection if you have iDevices. What was reviewed here was simply the introductory section available free today here. If the goal is to help learners prepare to make an oral presentation about photosynthesis it would be a help. This should be better explained in the Introduction. The Vocabulary will need more explanations and examples available if it is to stand in for the teacher-learner situation. The Pronunciation section could be improved but it is a huge advance over entry-level teachers/helpful native speakers. I think *any* pronunciation application is a positive contribution to the language learning community. This certainly doesn't replace the teacher. As a teacher, I would use this as designed as part of a CLIL approach to this particular topic if students were going to present or write on it. As a general EFL teacher I would use and recommend it for its syllable stress awareness raising and that really simple Voice Mirror. So is there anything novel here? No, not to an experienced teacher. But it is an interesting reflection on the gap between entry-level teaching techniques and automated best practice. A great start. I hope this grows some legs and runs.